I recently finished Weis and Hickman’s ‘the Lost Chronicles Trilogy’. This comes close to 17 years since I first read the original Dragonlance Chronicles. I was drawn to these books by my love of the characters of Krynn and the original tales that have been read by millions since their publication. To many, Dragonlance is synonymous with dungeons and dragons and is seen as a mild fantasy setting, which tends towards adventure and swords and sorcery rather than more serious epic fantasy. However you look at them, the original Dragonlance trilogies are an easy and highly enjoyable read, made famous by the Heroes of the Lance which populate the tales. The Lost Chronicles fill in the gaps from the original Chronicles and provide us with some insight into what happened to our Heroes in between the first novels. It also details events previously mentioned, but never fully explained, in particular where characters broke off from the main group and continued in the background. It is important to note that the three books of the Lost Chronicles could actually be read standalone and each cover separate stories. Though there is chronological order and some characters crossing over, each book focuses on different heroes. The first book ‘Dragons of the Dwarven Depths’ provides us with the tale of the Heroes’ escape to Thorbardin after their escape from Pax Tharkas. It is a tale that in itself is enjoyable to read and allows us to return to the characters we grew to love when first reading Dragonlance. Tanis, Flint, Tass and Caramon all carry out their adventure to the dwarven kingdom and we are provided with the amount of action and inter character banter that we have come to know. The first thing I noticed is that the grand scale of the original trilogy was lost in this book. It seemed much more like a one off story or adventure. That isn’t a bad thing, but threw me off a bit as when I pick up a trilogy there is a certain scale I have come to expect. Tass and Flint shine strongest in this tale and their interaction with the dwarf Arman Kharas was a pleasure to read. I enjoyed the story of Thorbardin and would definitely recommend it to fans of the series. ‘Dragons of the Highlord Skies’, the second novel in the trilogy, drew my attention to a greater extent. It deals with Laurana and Sturm’s journey to Icewall castle to obtain the dragon orb from Highlord Feal-Thas. It is a tale I have always wanted to hear more about and is presented in great fashion. A few new characters are thrown in which provides some extra conflict and the climax of the book is well received and exciting. The book also follows Kitiara, who is a character we love to hate, but also garners some new sympathy. It was great to get to know her better. The only disappointment in this novel is that from the very beginning you are waiting for the first meeting between Kitiara and the death knight Lord Soth. However this does not come until the very end and is for my tastes a little short, given the lead up to it. As for the final book in the trilogy, I loved it. 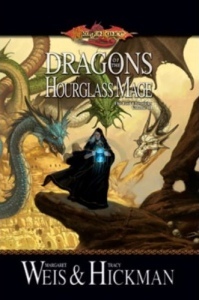 ‘Dragons of the Hourglass Mage’ covers the tale of Raistlin’s journey to Neraka. Raistlin is by far my favourite character and is the sole focus of this book. I believe that many other Dragonlance fans would appreciate a book which hones in on the famous mage’s aspirations and allows us to enjoy all that is Raistlin Majere. The story follows his transition to a black robe and his uncovering of Queen Takhisis’ plot to seize control of all magic. As always we see him weave his schemes with guile and ferocity and I found myself flying through the pages much quicker than the first two. Sadly the ending is a bit short, however this is more a result of the story’s place in the Dragonlance timeline. It ends at a point where the original Chronicles tell the rest of the tale, and as such feels a little abrupt. That being said it rekindled my love of the cunning mage. It is always hard to top a masterpiece, and looking back at the Lost Chronicles I can say that I am glad to have read them. But I now see them more as appendices to the original tale. They provide us with further insight into the motivations driving the Heroes of the Lance and show us previously unseen events. If you have read the original Chronicles and are looking for more of your favourite characters, then I recommend these books. If you are looking for a traditional trilogy with epic scope and a long story arc, return to the original Chronicles or Legends trilogies. This entry was posted in Reviews and tagged Book reviews, books, Dragonlance, Fantasy, Fiction, Raistlin Majere, Reading, Reviews, Writing by blottingaway. Bookmark the permalink.